1.1 Benefits of the Garmin Nuvi 57lm? I get it, you are an expert driver. You don’t need a navigator. That is all great, but you know what else is great? Not getting lost on your adventure! Let’s be honest here. You don’t buy a navigator for your daily drives towards your work or family. Those routes you can drive blindfolded, upside down in a UK old-timer with the driver’s seat on the left side. No, you purchased a Garmin to hit the road! To explore new cities and experience some adventure! Ok, another reason could be to not get late at that important job interview, but you get what I mean! After using the Garmin myself during my travels I though it would be a good idea to share my insights in this Garmin Nuvi 57lm Review. Get Your Free LifeTime Maps Edition Now – Check the latest price! Benefits of the Garmin Nuvi 57lm? Now that you already have the Garmin in mind, you must be wondering why should you get in the first place, right? There are various reasons that may compel you to buy any Garmin product. Spoiler Alert: Garmin Fanyboy Here! Garmin Real Directions – The “spoken” guide uses recognizable landmarks, buildings and traffic lights. Long battery life when not connected. Up to 2 hours. Want to Read More Benefits of the Garmin Nuvi 57lm? – Click here! To create a solid and informative Garmin Nüvi 57lm Review, I have tried my best to examine each and every feature of this tool. Technology –It makes use of what is called Foursquare technology to locate places, shops and restaurants to name some. That is to say, their database has detailed information about most places of interest (POI) that help you locate them quickly. Brand – Garmin is a well-known brand in the car accessory industry and you will not have a hard time using their products. The nuvi 57lm is no exception to this rule, as this product is easy to use too. Functions – The addition of new features like Direct Access, which helps to pinpoint POI in a large area and lane assist with junction view program assists you with speed limits make it a product to look forward to. There are a couple of supplements that make it a deal for you. Things like Up Ahead inform you about food and gas, while School Zone warnings keep you cautious. What more can you expect from a GPS? Read More About the Special Features – Click Here! It has a widescreen of 5 inches which is clear to read. It makes a big difference. As with any navigator, it gets a bit confused when traveling through big unknown cities & countries with a lot of construction en detours. It is nothing dramatic, and thankfully it still got me a lot quicker out of those situations compared to Google Navigation Maps. Want to Read More Reviews from Customers? – Check the latest reviews! By now, you may have got some knowledge about this gadget. Garmin as a brand has a very good reputation and with the Garmin Nuvi 57lm they sure hit a home run! 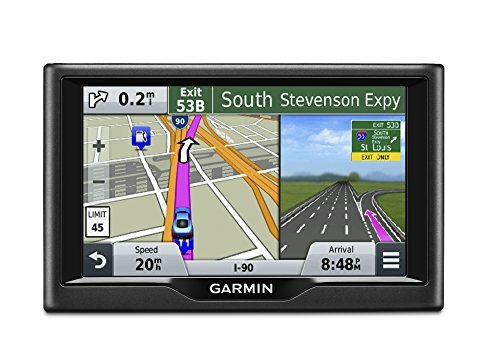 I was happy to use it during my travels and even though I always used Garmin before for my motorcycle trips, I was happy to see they can also provide a great system for traveling by car. I used it in combination with my Galaxy Samsung Smartphone, but one of the key benefits of the GPS navigator is its battery life. And we all hate how long it takes to charge our phone! You use your smart phone for almost everything and with you are roaming like crazy, GPS on and Google Maps it drains your power at rapid speed. The Garmin Navigator would last several hours without a problem. Is it a perfect GPS navigator? No, but it does get very close and to be honest I never found one that is. I have been using Garmin for years now (motorcycle and car) and I am still very satisfied with the high quality. You will always encounter unexpected roadblocks or road works, but the Garmin helped me out of a few tights spots, when Google Maps was still goofing around.